Click on the highlighted areas to learn more. Keep parking areas free from hazardous ground conditions like ruts, rocks, hoses, and ice. Provide designated walkways with clearly marked crosswalks to parking areas. Injuries when accessing equipment are often due to ruts, grooves, rocks, hoses, pipes, pallets, crib blocks, and slippery surfaces like ice, snow, or mud in the parking area. Maintain even rung spacing from the ground level to the cab. Be sure that rungs are flat and deep enough to place the foot comfortably. Avoid using circular bars or rods as rungs when possible. Choose rungs with small openings on the tread so contaminants cannot accumulate. Add non-slip coatings or grooves on the rungs to increase grip. Ensure handholds run the entire length of the ladder. Flexible-railed bottom rungs on mobile equipment can be especially hazardous. Getting off mobile equipment is more dangerous than getting on. 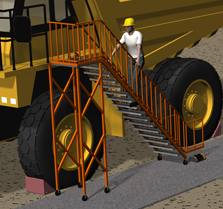 Construct and use access platforms with stairs and guardrails that allow operators to enter and exit the cab directly. Eliminate the use of vertical ladders for access to mobile equipment when possible. Most ingress and egress injuries on front-end loaders occur on equipment with vertical ladders. Ensure the lighting is uniform across the parking area. Space lights so adjacent beams overlap in order to avoid dark pockets. Regularly check light levels in parking areas using a lux/light meter to ensure they are between 2-4 foot-candles or 22-43 lux. Paint the stairs, ladder, and platform in a color that has a high contrast to the contaminant to make it easier to detect the contaminant. Insufficient lighting around mobile equipment can make it hard to detect hazardous ground or ladder conditions. Provide housekeeping supplies at a designated and marked location in the parking area to allow workers to remove contaminants from the equipment. 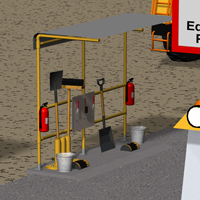 Provide boot brushes and boot cleaning stations on the ground near mobile equipment to help workers remove any contaminants from boots prior to getting on equipment. Provide boot cleaning stations at entrances to buildings and sheds. Muddy boots and hurrying are some of the contributing factors to slips when getting onto or off of front-end loaders. Include ladders, stairs, handholds, and platforms in inspections. During pre-shift inspections, look for loose, damaged, or broken components and contaminants. During regularly scheduled inspections, look for potential failures like cracks and loose, damaged, or broken components like rungs and doors that allow excessive or unexpected movement. Use a checklist to help ensure no items are overlooked. Provide backpacks, shoulder straps, or a pulley system to carry tools, equipment, lunch bags, and water bottles onto and off equipment. Provide adequate labelled tie-off points and encourage the use of a personal fall arrest system. Encourage fall protection use especially when performing maintenance, window cleaning, and other work at heights around mobile equipment. Have one person at ground level and one person on the equipment to transport large items onto and off the equipment. A PDF version of this interactive graphic is available. 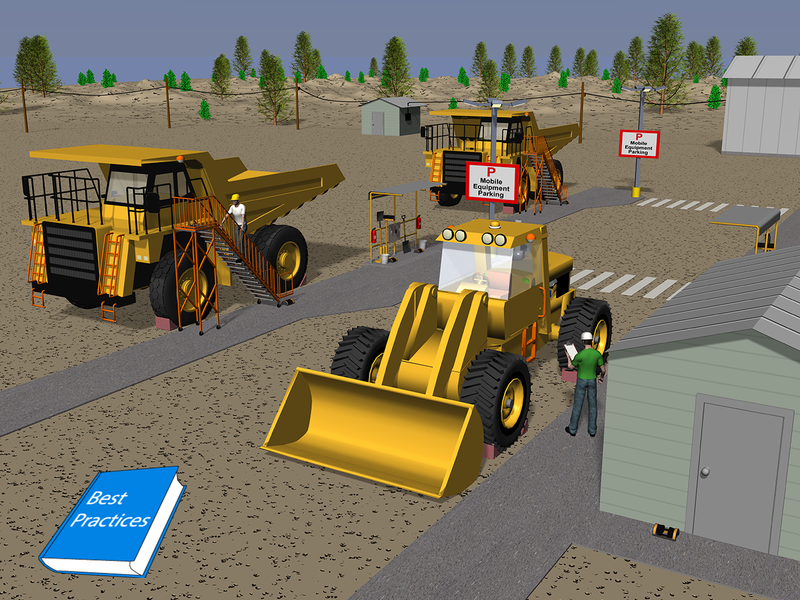 Nasarwanji, M. F., Pollard, J., Porter, W. An analysis of injuries to front-end loader operators during ingress and egress. International Journal of Industrial Ergonomics, 2018,65:84-92. Pollard, JP and Nasarwanji, MF. (2018) Preventing Falls from Front End Loaders during Ingress and Egress, Pit&Quarry, Jan 2018, 66-72.